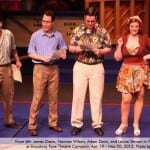 Mistaken identities, madcap humor, and some of the greatest songs of the 1940s fill this hilarious musical comedy. 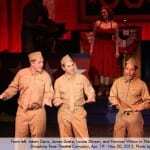 It’s 1945 in the South Pacific, and The Andrews Sisters are scheduled to headline the big USO show, but when a flu outbreak quarantines the girls and they fail to arrive at the big gig, three soldiers find themselves giving the performance of a lifetime! Songs include “Boogie Woogie Bugle Boy,” “Slow Boat to China,” “Shoo Shoo Baby,” and “Don’t Sit Under the Apple Tree.” The Andrews Brothers is complete with slapstick comedy, old-fashioned romance, and nostalgic music. Performance run time is two hours. Adam Davis (Max) has appeared in many things on stage and screen, gaining acclaim for his leading and supporting roles in various new musicals, off-Broadway revivals, feature films, and commercials, among other things. He is spending the year neck-deep in projects, including producing his own screenplay Last Gasps of a Desperate Man. He is grateful for his Broadway Rose debut as Max, to friends and family for their love and continuing support, to Portland’s mega-talented creative community for their hard work, passion, trust, and enthusiasm, and to God, with whom all things are possible. 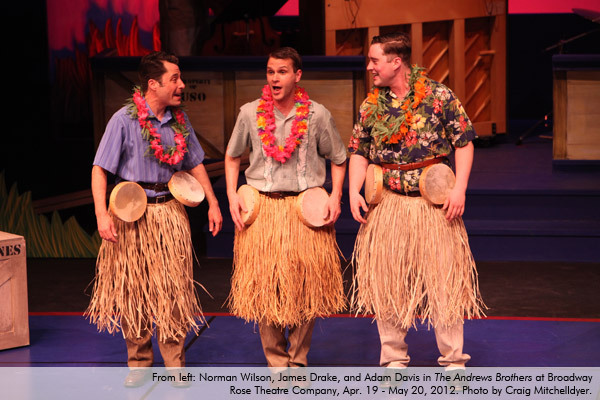 James Drake (Patrick) is thrilled to be returning to the Broadway Rose Theatre for his 8th production. He was last seen in Romance/Romance with his wife Lisa. Favorite Broadway Rose performances include Marius in Les Misérables and Smudge in Forever Plaid. Oregon credits include A Christmas Carol (Portland Center Stage), The Secret Garden (Drammy Award) and Into the Woods (Lakewood Theatre Company). Regional credits also in Seattle, Chicago, Ashland, and Indiana. National Tours: Evita (Magaldi & Eva’s Brother U/S). 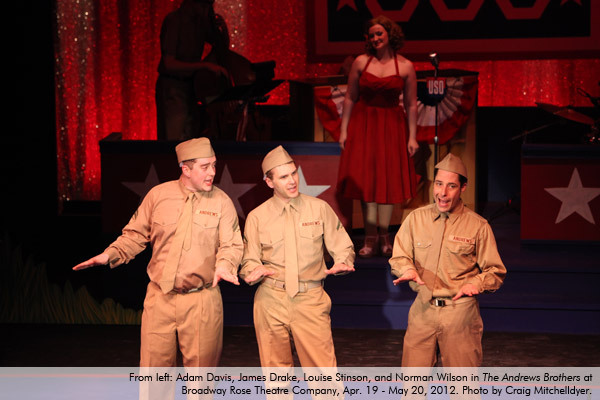 This past year he has worked on writing WWII musical The Dance with co-writer Jane Thatcher that honors the silent generation. 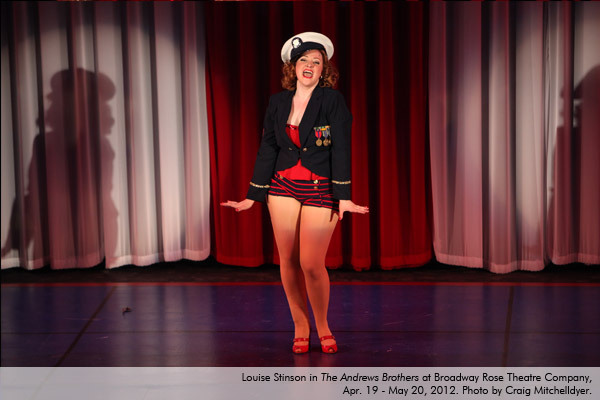 Louise Stinson (Peggy Jones) is excited to return to Broadway Rose! She was most recently seen in Portland with PDX Playwrights in A Pretty Girl with Cancer (Naja) as part of Fertile Ground 2012. 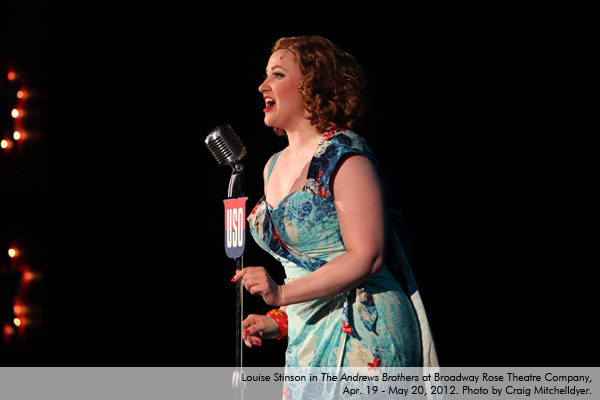 Past appearances with Broadway Rose: Alison in Bingo and ensemble in Evita. Lakewood Theatre Company credits: Greenwillow (Dorrie), Curtains (Georgia), Oklahoma! (Laurey), Where’s Charley? (Kitty), and the ensemble in Annie Get Your Gun and White Christmas. 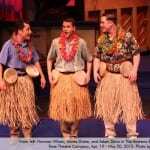 Other NW regional credits include: Bobrauschenbergamerica at Portland Playhouse; Anonymous Theater’s production of A Funny Thing Happened on the Way to the Forum (Philia); Stardust for Christmas (Ivy Sherman) at Harlequin Productions; Putting it Together (Woman 2) at Salem Repertory Theatre; Leavenworth Summer Theatre’s productions of Show Boat (Magnolia) and The Sound of Music (Liesl). Norman Wilson (Lawrence) is delighted to return to the Rose having played the role of Corny in last year’s production of Hairspray. Previous roles also include Madame George in Find Me Beside You at Theatre! 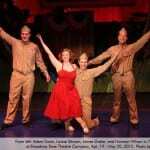 Theater!, Cadet Wally in Wild Space A Go Go at The Embers Avenue, Lucentio in Taming of the Shrew & The Woman’s Prize at Bag ‘n’ Baggage, Charlie Davenport in Annie Get Your Gun at Lakewood Theatre and Racist Everyman in Violet for Staged, among others. Saturday, May 12, 2:00 PM – Audio description available. [They] sell the slapstick…It’s a hoot, I tell ya. Read the rest here. With its vibrant production of The Andrews Brothers, Broadway Rose Theatre Company brings two hours of non-stop ‘40s-style musical entertainment to Tigard’s New Stage Theatre…exceptional vocal harmonies…uniformly strong singing voices…Adam Elliot Davis (“Max”), James Langston Drake (“Patrick”), and Norman Wilson (“Lawrence”) blend beautifully, and their comic timing is impeccable…Read the rest here. Ready for a musical escape into a distant decade? Look no further than Tigard. 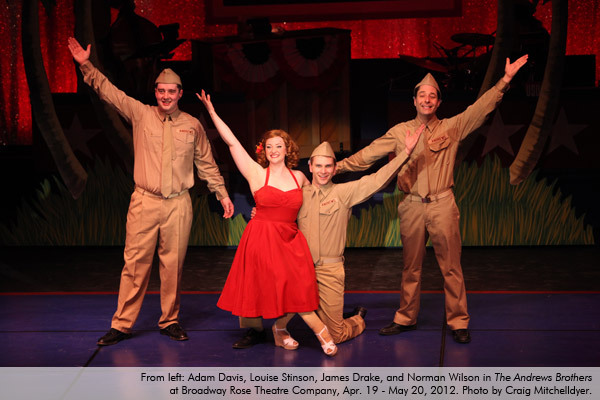 The Broadway Rose Theatre Company, located in that Portland suburb, continues its 2012 season of Great Escapes with Roger Bean‘s new ’40s musical The Andrews Brothers...Read the rest here. 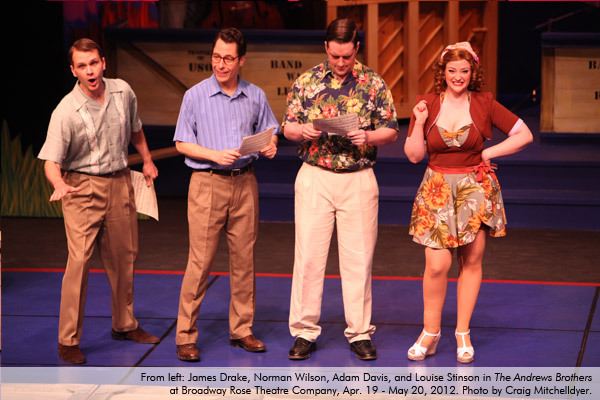 …she stands out as the only female in the four-person production that is set at a USO show in the 1940s. 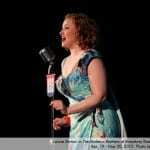 Stinson plays Peggy Jones, a Rita Hayworth type pin-up girl and opening act for the Andrews Sisters while trying to become a full-fledged performer on her own. Read the rest here.